1) If you’ve ever met me, you would know that I own 2-3 nice “professional” outfits. I wear one maybe 2 times a year. Most of my free time is spent in jeans and a t-shirt or workout gear. When I see clients, I wear khakis, a scrub top and a tank top underneath to keep my underwear from showing. Sure, this may count as “professional” work wear in my field that consists of me getting sloshed with lots of water on a regular basis, but it doesn’t quite feel “professional” to me. My mentor taught me the mentality behind a “doctor disguise.” You have to look like a doctor so people see you as an authority figure. Hence my scrub top and khaki combo. 2) My computer bag is big, chunky and totally practical. A new, pretty one would be at least $100 and I can’t justify that purchase. Plus, I have a relatively heavy computer (PC > Mac, sorry) that I don’t bring anywhere but back and forth from my office. 3) Metropolitan? Far from it. I live in Santa Cruz, CA, which is not as anti-metropolitan as my hometown in Connecticut, but a nice outfit does not work in a town of college students, artists and tourists. Those lawyers and accountants strolling the streets for lunch stick out like penguins. So, in trying to create a “professional” internet presence, I am struggling to make it maybe something that I am not. I am stumbling down the path to becoming a writer and a polished appearance never hurts, but it does not align with who I am and my career. I am a veterinarian. Veterinarians work with animals and all get dirty on a regular basis from something. When I was on clinics as a student, I wore something nicer, consisting of khakis, a sweater, hideous clogs, and a long white coat. The white coat protected the nice outfit from most of the chaos. For my job, however, traipsing through peoples yards and kneeling over a big tub full of water does not work with a skirt and heels. 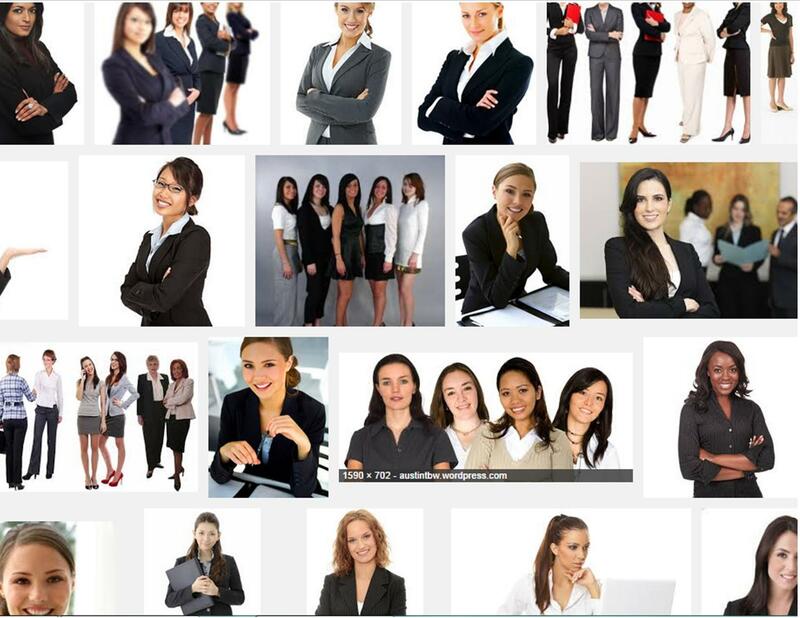 So, where are the “professional women” wearing my trademark outfit? Good luck with that Google search. I scrolled for 5 minutes and couldn’t find anyone not wearing black. If you want to check out all of my alter egos, check out my Contact page.